Get the most out of your 2018 Footy Festival experience with the MILO Kids Zone! Official Sponsor of the AFL, MILO is bringing you the biggest and best footy fun yet. Race your friends through the giant inflatable obstacle course, try your foot at jumbo AFL grid games, and cap off your experience with a nourishing and delicious MILO. NAB AFL Auskick Clinics are back and bigger than ever in 2018! Clinics will be running on the hour on Wednesday and Thursday. Kids who participate in our super fun footy clinics will also have the chance to meet their favourite AFL players, as well as receiving some cool prizes. Auskickers can secure their spot early by registering at play.afl/auskick, registrations open mid-September. Other young footy fans can book and take part on the day but this will be subject to capacity. So get there early as spots go fast! The AFL Kids Epica Finals Experience is here with another collection of the best kids activities and family fun within the MILO Kids Zone. 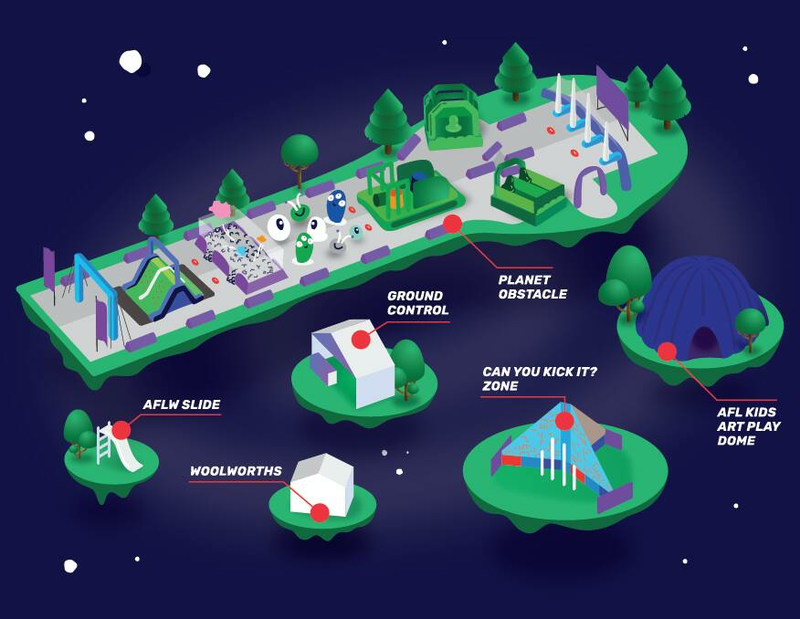 Featuring The Epica Passport journey, The Woolworths AFL Playground, Art Play Area, Immersive AFL Kids Dome and much more, this Epica experience proves to be more epic than ever! Race your mates on the AFL’s biggest ever inflatable obstacle course, immerse yourself within our mystery Dome, meet your favourite AFL/AFLW players and collect giveaways and prizes daily. We look forward to seeing you in our world! Come run and jump in the most epic obstacle course you’ll see! Is it a shooting star? Is it a UFO!? No…it’s your seriously bonkers football creation! Let your imagination fly through space and see how wacky you can get! Put your footy skills to the test and see if you can blast your footy through the goals!